Very rare single from the soundtrack of a road movie. Single only released in Australia from the score of the 1978 Ebsen Storm movie In Search Of Anna. John did some work for the score and shared the honour with AC/DC of all bands. 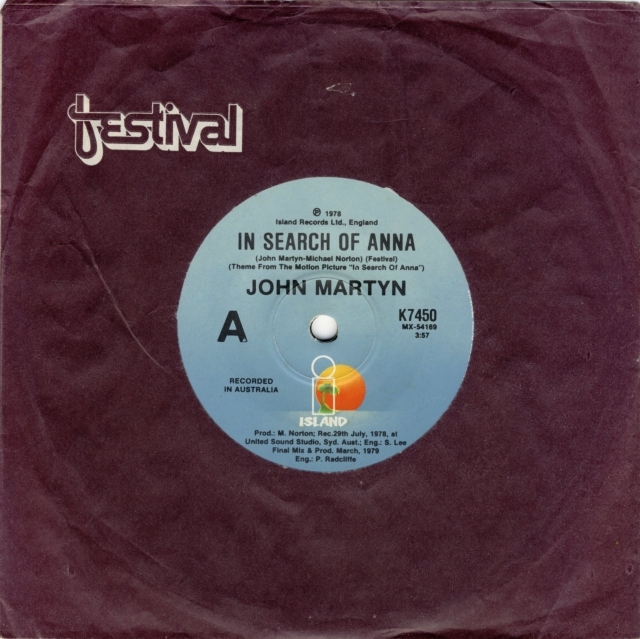 Anna (the label says "In Search Of Anna" was recorded 29 July 1978 at United Sound Studios, Sydney, Australia. Final mix and production took place March 1979. Certain Surprise is a live recording made during the 1977 tour, in Sydney, Australia. "All production details are (surprisingly) printed on the record label. I expect that at most only a couple of thousand copies of the single would have been pressed at the time, and as the single did not chart here, that very few would still exist." There was no picture sleeve.